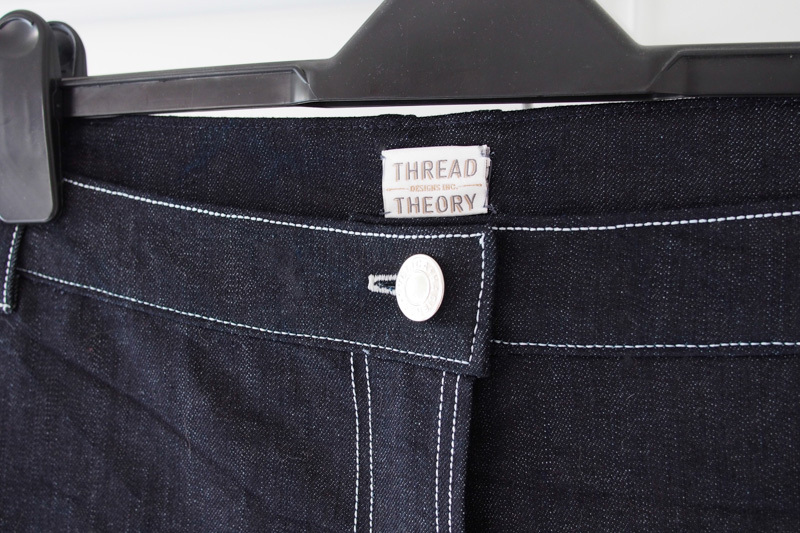 I haven’t done much sewing for myself lately, but I managed to fit in some shorts that Josh has been requesting for ages – Thread Theory Jedediahs to be exact. I’ve been promising him shorts for a while, and while I missed most of the summer season, he’s off to California with work soon so they should get some wear out there. 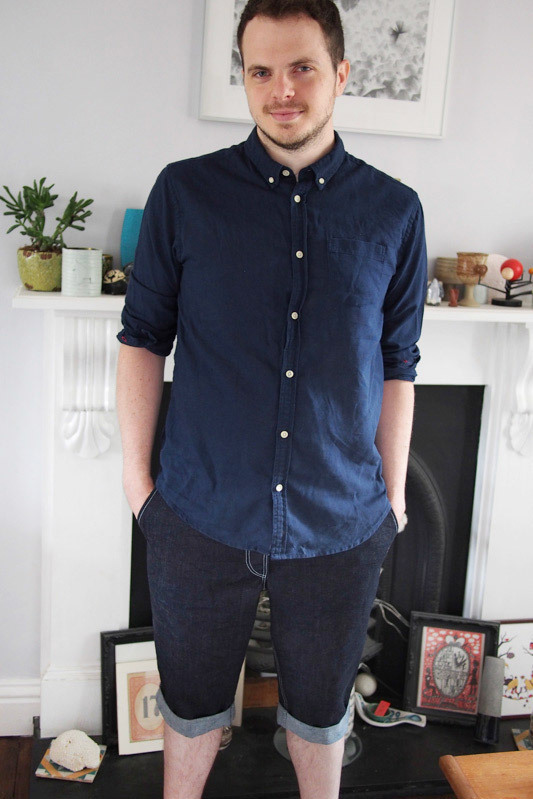 Naturally, he chose a slightly challenging fabric and thread combo: a stretchy medium-heavy indigo denim together with a super contrasty baby blue topstitch. 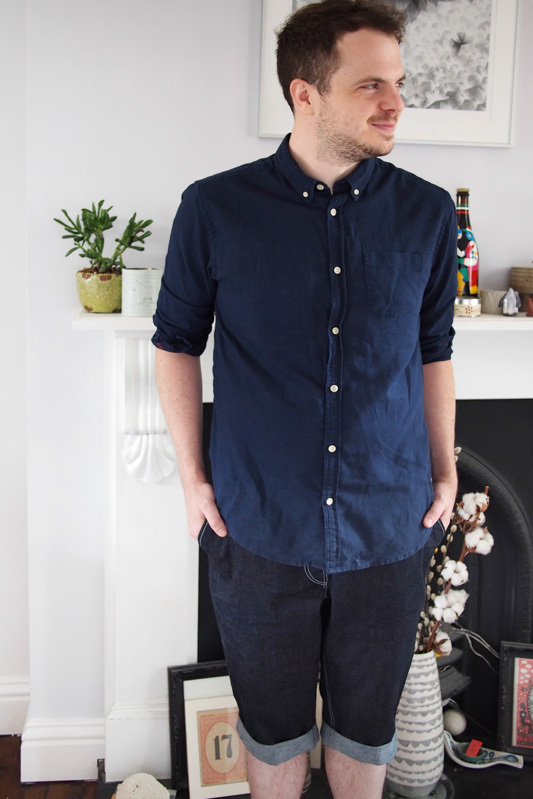 The fabric was a very generous gift from Jennifer of Workroom Social during our New York trip – it’s the famous Cone Mills denim as used in the Ginger jeans kits. It was slightly harder to work with than rigid denim as the presser foot pressure plus the stretchiness will mean you get a bit of rippling and distortion if you’re not careful. However it has excellent recovery so a good steam helped things get back into shape. Josh gives it an A+ for comfort so it was a good choice overall. Besides that, sewing these up was straightforward and enjoyable. 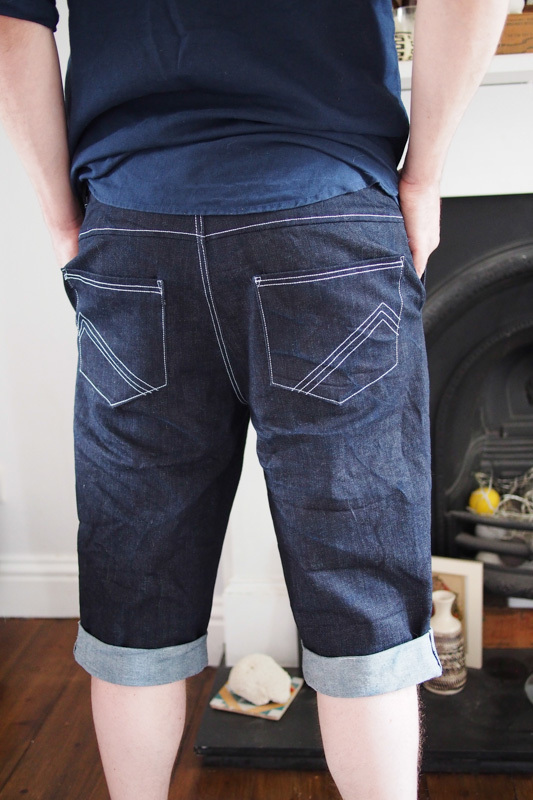 I followed the included instructions booklet up to installing the front pockets, but defaulted back the the Ginger method for the fly front and topstitching guidelines since we were going for jeans-style finishing. You may have noticed I managed to sew the fly the ‘lady’ way round ie topstitching on the left as you look at them instead of the right. I swear I reversed the Ginger instructions, but must have had a brain fail along the way. Luckily Josh doesn’t mind! 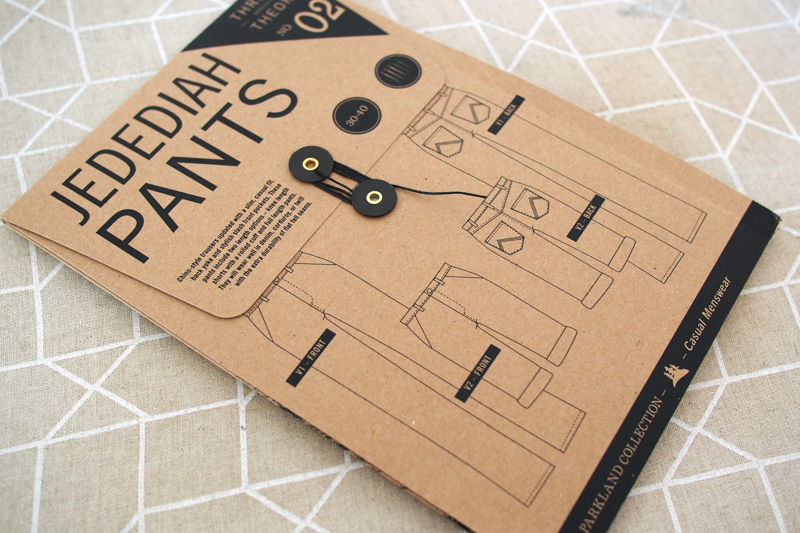 I didn’t find the Jedediah instructions all that clear overall in either the descriptions or diagrams, so I don’t think these would be suitable for a first-time pants project. But I do love the packaging and the fact that a little label was included. Plus there’s a sewalong which I’m sure would clear up some of the trickier steps. 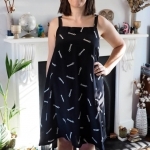 I bought the printed pattern from Backstitch here in the UK by the way. And the drafting seems pretty great. 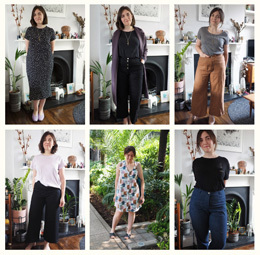 I cut a straight size 34 and only made tiny adjustments after a baste-and-try-on at each stage. 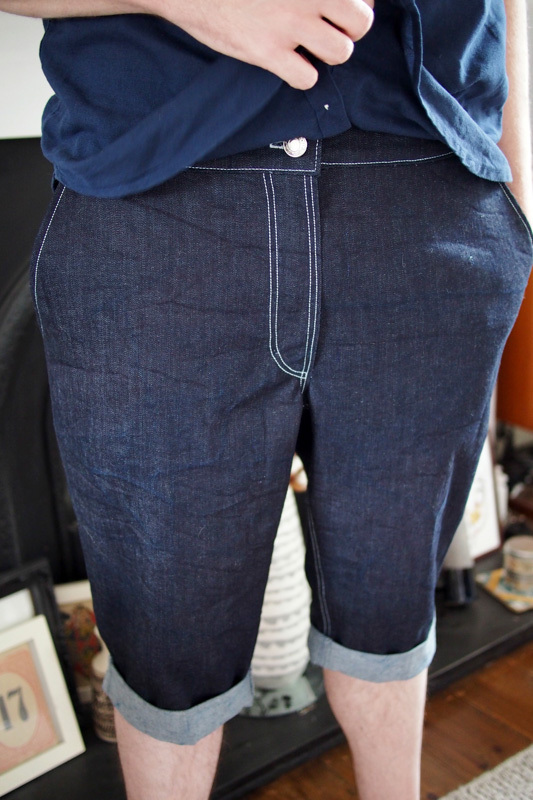 To compensate for the denim’s stretch I sewed the side seams with a slightly larger seam allowance and pulled the waistband quite tightly as I attached it, cutting off a couple of inches excess at each end. 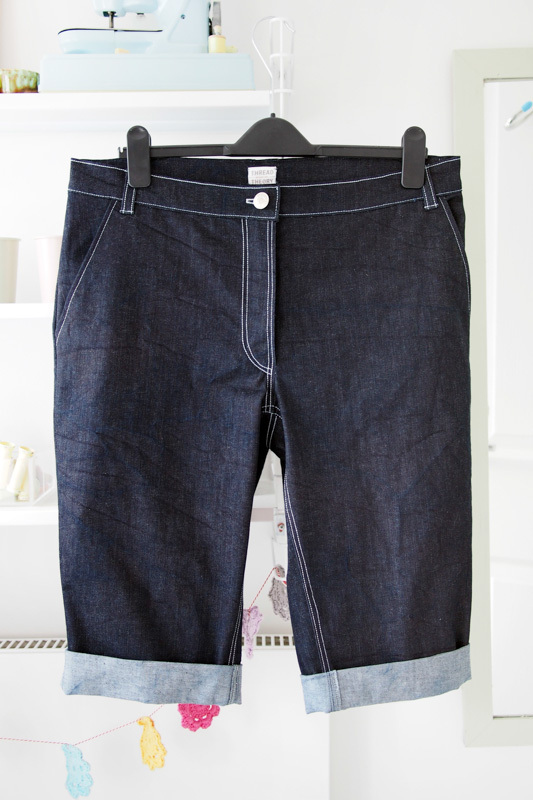 The hems are turned with a generous double cuff and tacked in place. I’m moderately happy with my finishing and topstitching. 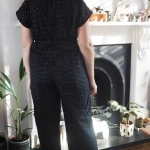 I had to rip and redo a few bits of wobbly topstitching, and I didn’t go for anything fancy on the insides – just serged and topstitched seams for a faux flat-fell look. Bravo! They look beautifully made and well fitted. Hope Josh has fun in California! Hide your other Cone Mills while he’s gone… or just sew it up for yourself? 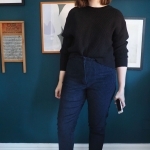 It’s jeans season! I’m jealous of his trip! Ha, I like your thinking, and I’m definitely thinking jeans for myself soon too. They are amazing! Such beautiful perfect top stitching, well done wrangling that fabric! Thank you! Not quite perfect but the effect from afar is alright. What a great job you’ve done on them – no wonder he looks so chuffed! Thanks! Nice to be generous occasionally and see it appreciated. They look great but I say hide that denim! Dudes don’t need stretchy jeans! I’m so confused!! 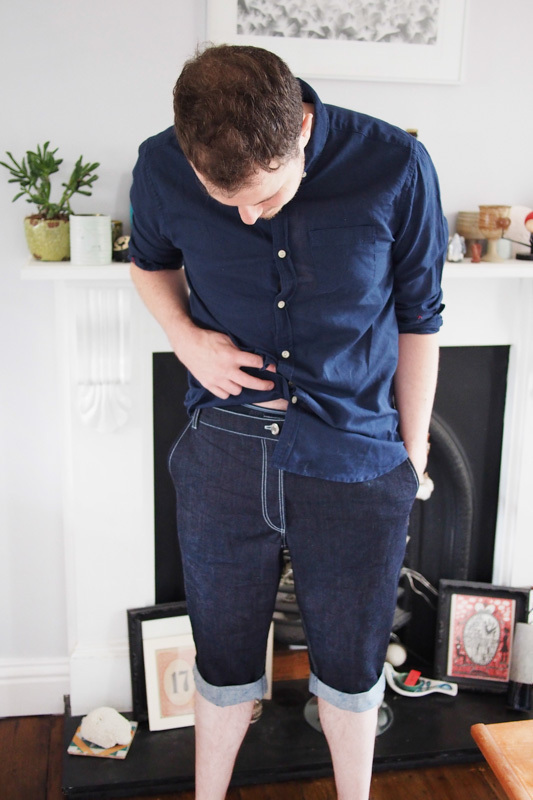 They’re the wrong way to his other jeans, but I’ve just looked online at some man jeans and they all appear to be right hand as well (as are my other RTW jeans). So maybe all jeans are right hand?! To be honest it’s potluck which I go for when I make my own pants, ha ha – I’m a lefty so it’s good either way! These look great Katie! Your topstitching looks awesome and I love the little pocket design. Such a generous gal giving up your conemills denim! And I agree with Katie ^ I think you sewed the fly on the right side. It’s opposite to the fly on the pants I am currently wearing anyway. Well, that’s weird, it’s the other way to all his other pants, which is why he noticed it felt odd! Maybe it’s a different convention in different countries. These look amazing! Fantastic job! I just got a little confused when I looked down at my shorts and saw they zip the opposite way, but then I remembered that they’re “unisex”, a long-ago purchase from American Apparel, ha! Man I have no idea what’s right or not any more! These look great! The Jedidiahs I made for my Husband were just a bit too small, I think they look great in denim.